Good day folks! How are you all doing? Excited for the long weekend? Off to Dragon*Con, or doing something equally cool? Whatever you’re up to, let’s start the weekend off right with a little Fiction Fashion Friday! Today on FicFashFri, we’re going to look at a character from whom we explore what a real-life “Batman” (a superhero forged in vengeance) would be like. Of course, we’re talking about Rorschach from Watchmen. 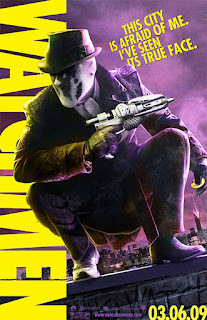 Rorschach is a superhero who still dons his mask and fights crime, despite laws being passed to ban masked vigilantism. 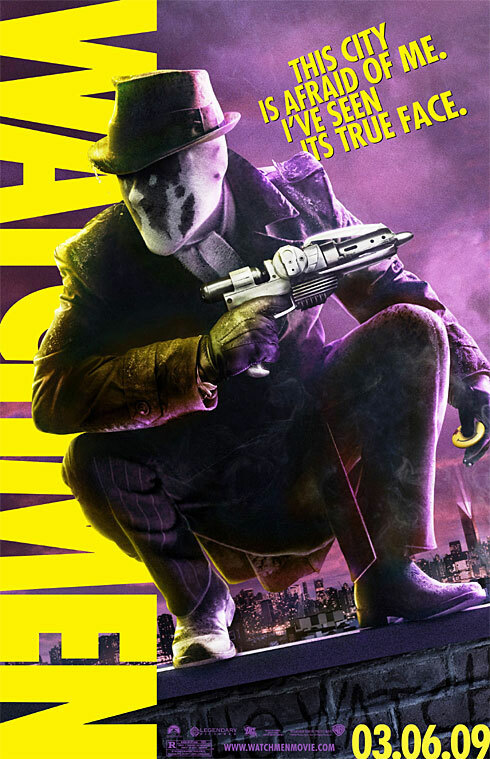 However, Rorschach is not the type to leave the bad guy for the police to pick up; oftentimes a run-in with the ink-blotted man will prove fatal for criminals. While not superpowered, he is a great athlete, a competent fighter, and an intuitive detective. 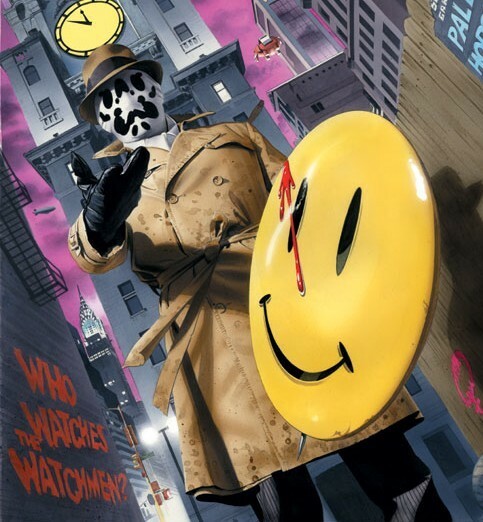 Watchmen is a classic comic book mini-series and most recently a film that takes place in an alternate history where costumed heroes fight crime, but with a more realistic spin. After a law is passed that prohibits heroes from donning their masks, heroes go back to their daily lives. 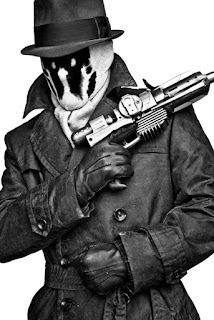 Only one hero remains at large: Rorschach, investigating the death of a man named Edward Blake, who was the Comedian – a government-sponsored superhero who fought in an alternate Vietnam War (which America won) and who was previously on a crime-fighting team with Rorschach. This leads to a web of intrigue in a 1980’s Cold War age where tensions are at an all-time high, the Doomsday Clock is dangerously close to midnight, and where former heroes are being picked off and no one seems to know why. That’s where the main storyline of Watchmen begins. 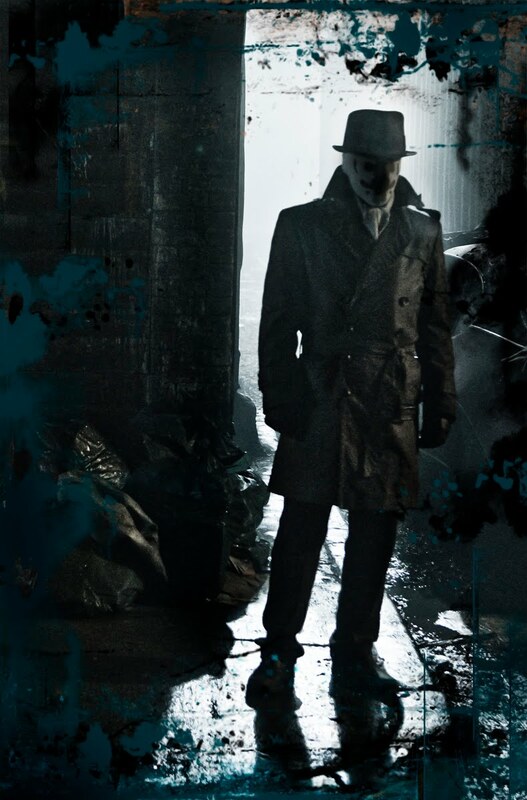 Rorschach’s hero outfit consists of a tan trench coat and matching hat, a purple pinstripe suit, a white scarf, brown shoes, and his trademark ink-blot mask, in which the black spots change shape and look much like the Rorschach ink-blots from which the hero takes his name. This outfit is meant to show his persona as an investigator. He holds a couple of items inside the pockets, including a grappling gun and a lighter, but may carry more. Oddly enough, his trench coat isn’t a long-flowing one associated with most detectives, but is more of a half-length coat buttoned up and tied at the belt, which certainly keeps with the more realistic tone of the series, given that most heroes in fiction have long flowing coats which would be impractical in real-life. Regardless, his outfit, combined with his trademark mask, creates an imposing figure to strike fear into the hearts of evil-doers… at least those that get in his way. Thank you for once again tuning into Fiction Fashion Friday! This entry was a little dark, but that happens when mentioning Watchmen! Be sure to email us, comment on Facebook, tweet on Twitter, or just comment here on the blog if you have suggestions for FicFashFri! The post Fiction Fashion Friday – Rorschach Test appeared first on .